The video of the eleventh module is now available, in which we will show how to reproject vector layers. Sometimes municipalities need external geographic information to work, for example cartography published by another administration, such as regional or national. That cartography can be in a different system than technicians usually work on in the municipality. If we don’t take the reference systems into account, both cartographies would not be overlapped correctly. The municipality technicians can also use old cartography, which is in an obsolete reference system, and they need to have it in an updated reference system. For this, it will be necessary to reproject that cartography. In module 2 you can consult all the information related to the reference systems. Apart from reprojecting from one reference system to another one, sometimes it will be necessary to apply a transformation to improve the reprojection. For example in the case of Spain, to reproject a layer available in ED50, the official reference system until a few years ago, to ETRS89, the official system currently, it is necessary to apply a transformation by grid, otherwise we would have a difference of about 7 meters between these layers. 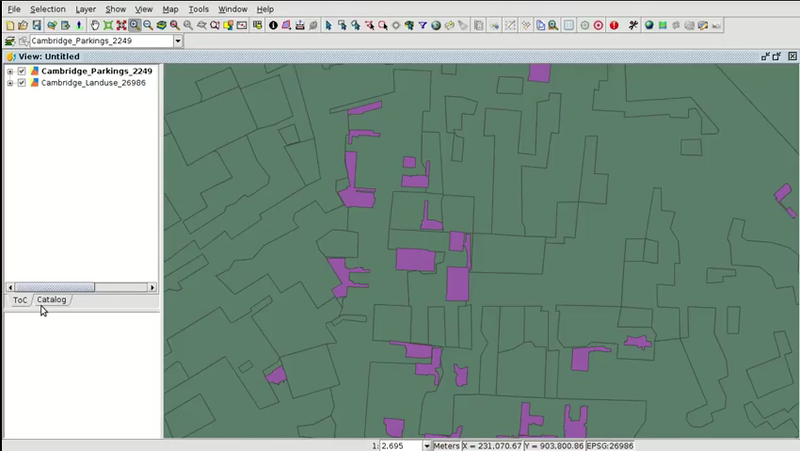 This entry was posted in english, gvSIG Desktop, training and tagged city council, gis, municipality management, Reference System, Reprojection, Vector layers. Bookmark the permalink.